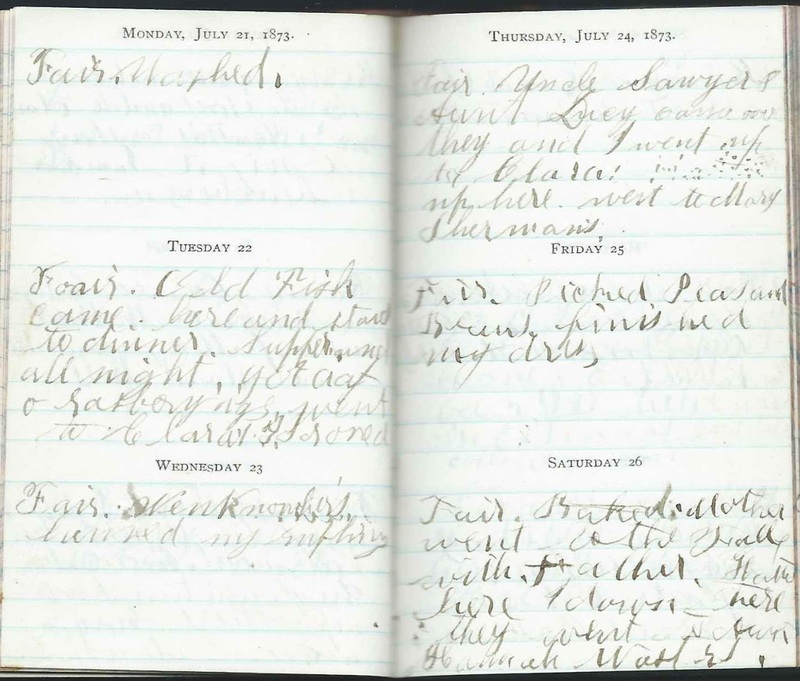 July entries in the 1873 diary of Ida Isadore Reynolds (1860-1946) of Acton, Maine. Ida would marry John Jotham Shapleigh (1856-1923) in 1881. Links to the months of April 1873 and June 1873 appear here and at the end of this post. 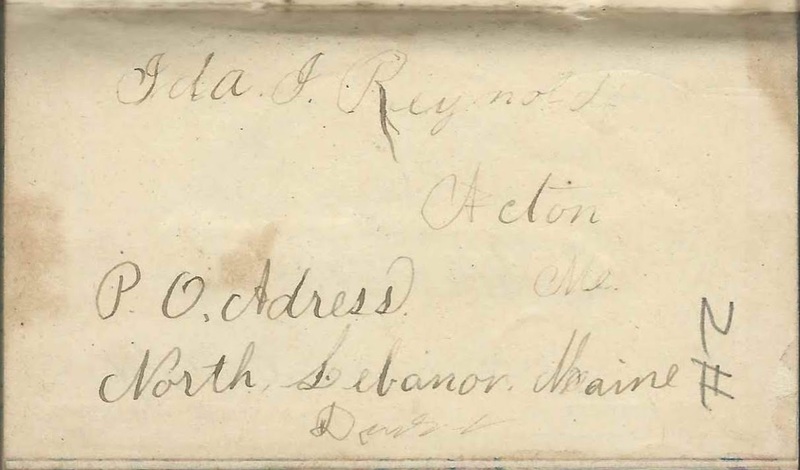 As you can see from the images below, Ida's physical address in 1873 was Acton, Maine, but the family received the mail through the North Lebanon, Maine, Post Office. Sunday June 29, 1873: Fair. Read. Went to Enoch's to see John &. Sarah Hersom and baby. Monday, June 30, 1873: Fair. Mother sent her ___[wool over ?] by George L. Prescott . ___ went to Clara's; she and Myra and Hattie here. Tuesday, July 1, 1873: Rainy. Broke our Needle to our Machine. Made 1 Vest could not do any more. I ironed. Wednesday, July 2, 1873: Fair. Mother went to Great Falls. Mr. Fisk here. Paid him for 3 lessons, all I have taken. Went to Clara's. Hattie here. Thursday, July 3, 1873: Fair. Mother went to Enoch's. They___ here come here ___. Uncle John and Enoch here. ___ [Commenced ?] haying yesterday. 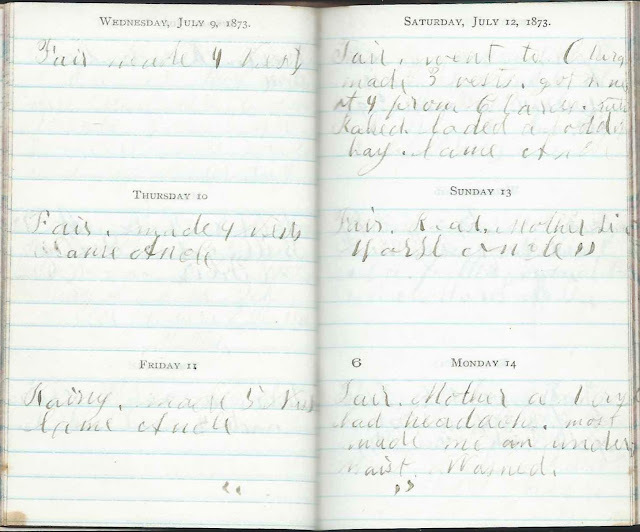 Friday, July 4, 1873: Fair. Visitors, Nell, Uncle John & Aunt Sarah Sherman here. Callers, Mary & Enoch, Zeke, Carlos, Clara & Hattie; went to Hattie's. Saturday, July 5, 1873: Fair. Baked. Made 4 Vests. Sunday, July 6, 1873: Fair. Read. Hattie here. 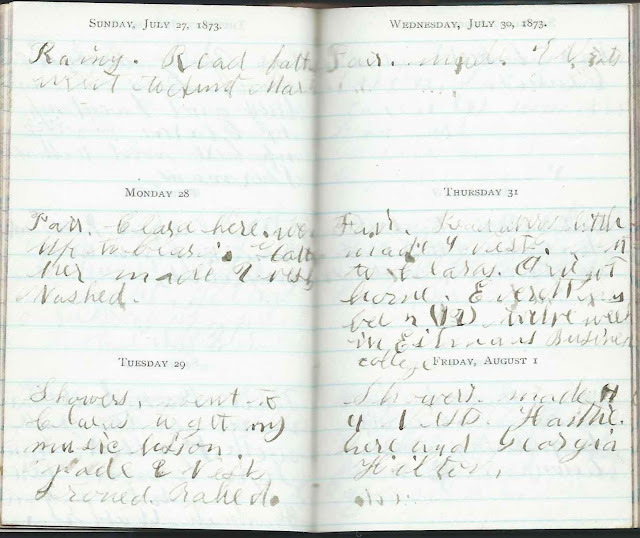 Monday, July 7, 1873: Sold our lamb __ [to ?] Bill. got 5 Doll [dollars ? ], my one Fair. made 9 [or 4] vests. Wednesday, July 9, 1873: Fair. Made 4 Vests. 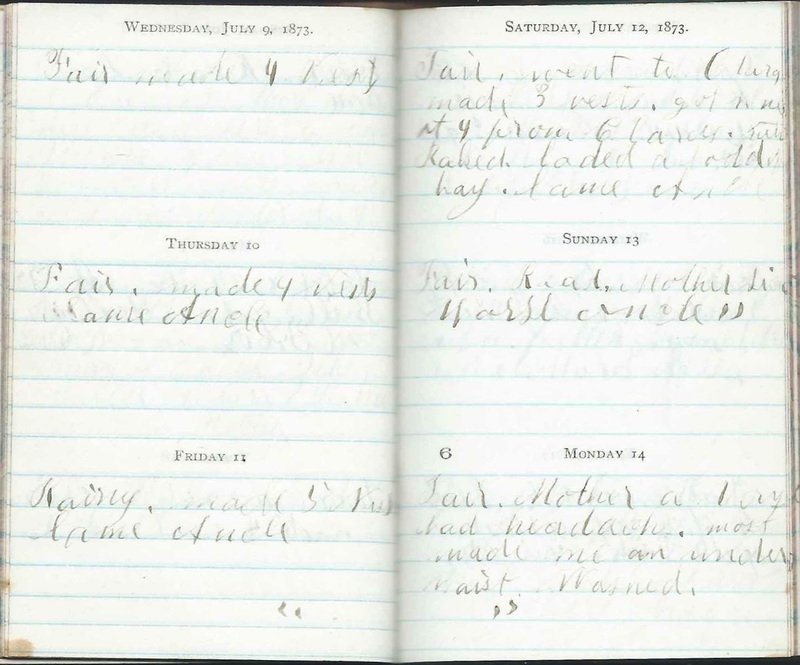 Friday, July 11, 1873: Rainy. Made 5 Vests. Lame ankle. Saturday, July 12, 1873: Fair. Went to Clara's. Made 3 Vests. Got home at 4 from Clara's. Baked. loaded a load of hay. Lame ankle. Sunday, July 13, 1873: Fair. Read. Mother ____ . Worse ankle. 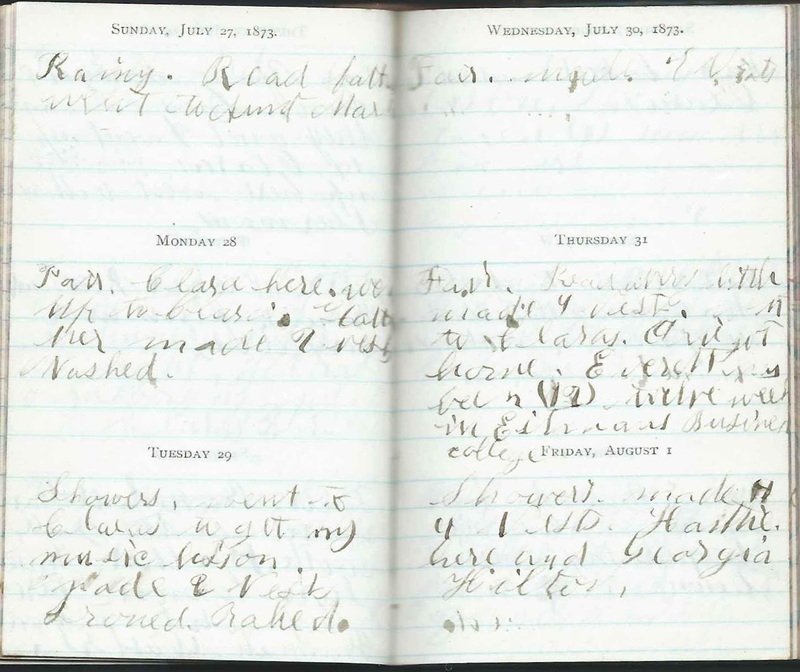 Monday, July 14, 1873: Fair. Mother a very bad headache. Most made me an under waist. Washed. Tuesday, July 15, 1873: Fair. Went to Clara to learn my music lesson. Almost got it. Wednesday, July 16, 1873: Fair. We have got 17 loads of hay in the barn. 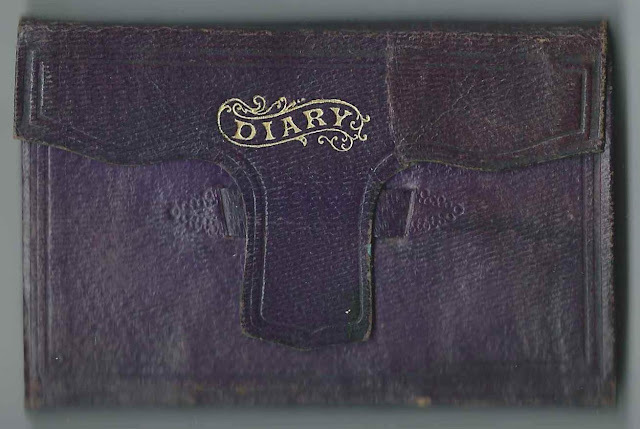 Thursday, July 17, 1873: Fair. Went to Clara's to take my lesson of Mr. Fisk. 40 cts. 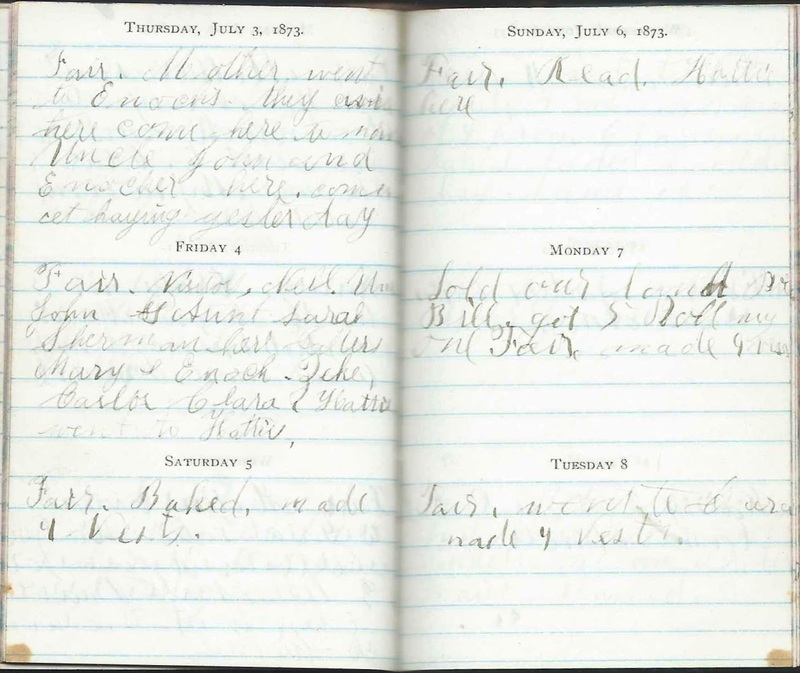 Friday, July 18, 1873: Rainy. Went to ___ [Odells ? ], Mr. Hilton's and to Clara and Hattie's to stay all night. Sam went a-blueberrying. 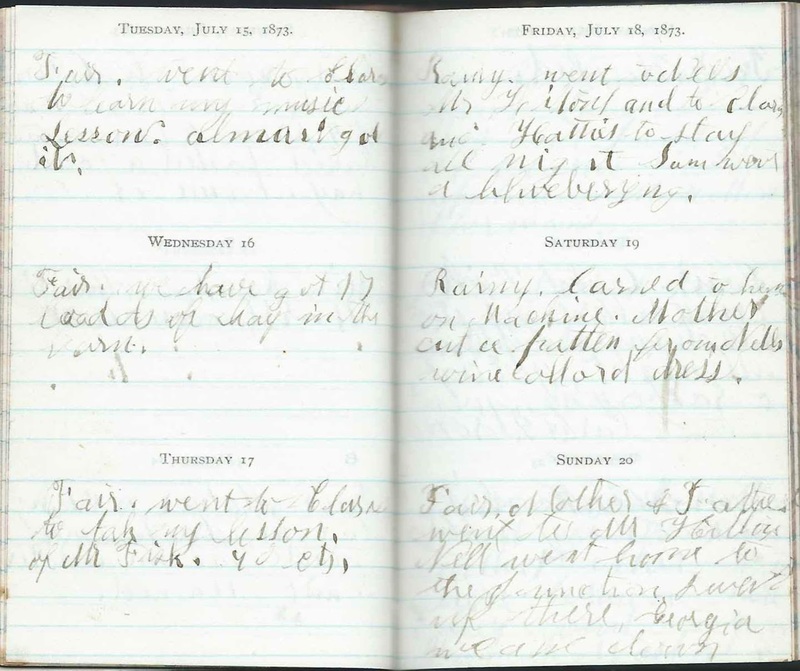 Saturday, July 19, 1873: Rainy. Learned to hem on Machine. Mother cut a pattern from Nell's wine colored dress. Sunday, July 20, 1873: Fair. Mother and Father went to Mr. Hilton's. Nell went home to the Junction. I went up there. Georgia; we came down. Monday, July 21, 1873: Fair. Washed. Tuesday, July 22, 1873: Fair. Old Fisk came here and stayed to dinner. Supper and all night. got a qt. of raspberries. Went to Clara's. Ironed. Thursday, July 24, 1873: Uncle Sawyer & Aunt Lucy came over. they and I went up to Clara's. Hattie up here. Went to Mary Sherman's. Friday, July 25, 1873: Fair. Picked Peas and Beans. Finished my dress. 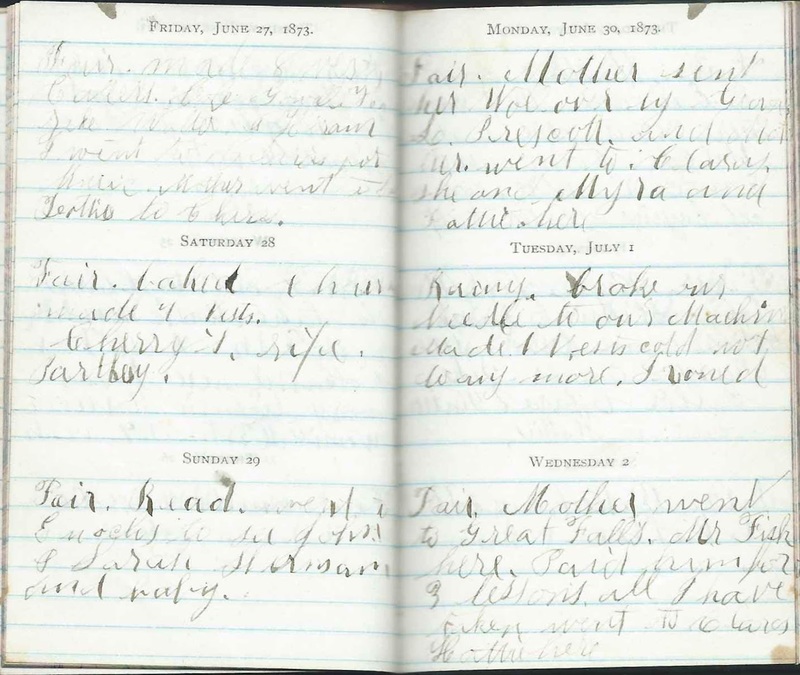 Sunday, July 27, 1873: Rainy. Read. Father went to Aunt Martha's. Monday, July 28, 1873: Fair. Clara here. We up to Clara's. ___ made 7 vests. Washed. Tuesday, July 29, 1873: Showers. Went to Clara's to get my music lesson. Made [?] vests. Ironed. Baked. Wednesday, July 30, 1873: Fair. Made 7 Vests. Thursday, July 31, 1873: Fair. Read a very little; made 4 vests. Went to Clara's. Orie got home. Everett has been (12) weeks in Eastman's Business College. 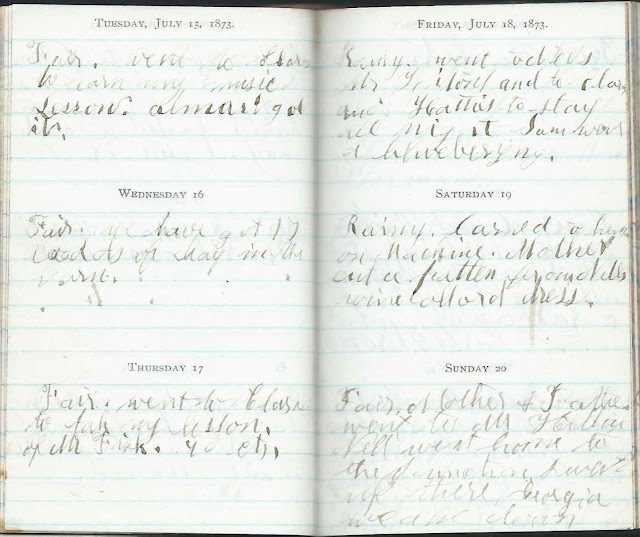 Friday, August 1, 1873: Showers. Made 4 Vests. Hattie here and Georgia Hilton. People mentioned in order, first time, only. Readers are requested to provide more information. Orie - possibly Orianna Maria Prescott (1848-1832), wife of Nicholas Blaisdell Shapleigh (1842-1924), or Orianna's brother Oren Burbank Cheney Prescott (1850-1925), although he was normally known as "Cheney"